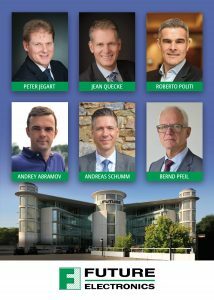 Egham, UK – 01 October, 2018 — Future Electronics, a global leading distributor of electronic components, has strengthened its customer-facing operations in the EMEA region with the appointment of a number of experienced and successful executives to senior sales roles. The appointments in central Europe, Italy and Russia mark a new phase in Future Electronics’ story of rapid growth from 1986, when the Canadian company set up its first Munich branch, to today’s pan-European organization, supplying electronics components, technical knowledge and advanced supply chain solutions to customers from 42 locations across the region. The new appointments include the recruitment of Bernd Pfeil to be Vice-President of Sales for the Central Europe region, covering the D/A/CH countries of Germany, Austria and Switzerland. Mr Pfeil brings to Future Electronics some 30 years of experience in sales, marketing and account management roles in the electronics components sector. Working for Mr Pfeil is Andreas Schumm, who joins Future Electronics in the role of Central Europe Technology Director. In his new role at Future Electronics, Mr Schumm will draw on a wealth of technical and engineering knowledge which he has gained over a 23-year career in electronics component distribution. Also joining Mr Pfeil’s team is Jean Quecke, Future Electronics’ new IPE (Interconnect, Passives and Electro-mechanical components) Sales Director for Central Europe. Mr Quecke brings to the role a deep knowledge of the IPE components market which he has gained from his work on both the distribution and supplier sides of the business. Also joining Future Electronics is Peter Jegart, the new Global EMS Director in Central. Mr Jegart will be responsible for sales and service to the crucial contract manufacturing market, which benefits from the world-class logistics and unified inventory management services that Future Electronics offers on a global basis. Elsewhere, Future Electronics is also announcing the appointment of a new Country Director for Italy: Roberto Politi’s experience in sales, management and supply-chain roles will serve him well as he assumes leadership of Future Electronics’ Italian operations, including its branches in Milan, Bologna and Padua. In addition, Future Electronics has recently appointed a new Country Director for Russia. Andrey Abramov will spearhead Future Electronics’ efforts to extend the benefits of broad component availability and world-class logistics services to Russian electronics design and manufacturing companies.